Recently home from yet another trip to the hospital, Sid Ortis is grateful. Grateful for another day to fight, grateful for God’s mercies, and grateful for his family and friends. 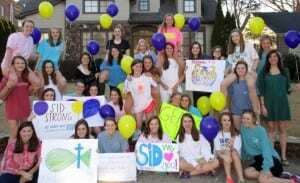 Hundreds of friends showed Sid their love and support by decorating his community in purple and gold…favorite colors of any LSU Tiger fan! Isn’t that just what a TOUGH Kid does to a whole community? 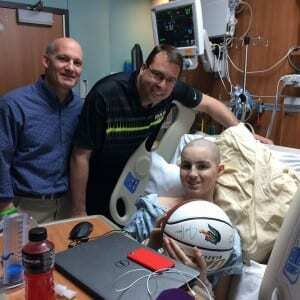 Sid’s courageous attitude in the face of many trials inspires us all…even Coach Les Miles. The reportedly playful phone conversation between Sid and his favorite football coach ended in prayer and sincere encouragement. I am willing to bet this coach was inspired beyond words. Diagnosed with osteosarcoma last August, the entire Ortis family has endured much these last seven months. Through chemo, radiation, surgeries, returning cancer, and a recent surgery to remove cancerous lung tissue, Sid and his family fully understand what it means to be TOUGH. It is nearly impossible to adequately describe the kind of pain, fatigue, nausea, loneliness, disappointment, and near despair a child experiences in moments like these. Yet, God’s grace overcomes and, out of the depths, springs forth the flowering radiance of new life: Hope. Their tenacity, optimism, unselfishness, gratitude and purpose-filled choice to find happiness in difficult circumstances is not only highlighted by their personal journey. They want to give back. In order to help the Ortis family in their fight against pediatric cancer, please sign up for Strike Out Pediatric Cancer. For every strikeout made by a Mountain Brook High School pitcher, a donation will be made to pediatric cancer research. We congratulate you, Sid, for being One TOUGH Kid! Thank you for being our hero! Please continue to pray for Sid and the Ortis family. Their fight continues every day. Pray for healing, strength, and grace. Honor Sid and other TOUGH Kids by choosing to face each day with gratitude, tenacity, and hope. As they inspire you, your life can do the same for others…even for a special young man named Sid.